Lord Leighton, Alma Tadema, The Pre-Raphaelites, all names that I was loathe to mention when I was at Art School in Oxford in the early seventies. In “The Bluffers Guide to Art” which my Father gave me when I went to Art School, the author suggests throwing in an enthusiastic reference to Burne-Jones as a way of stirring up a dull cocktail party and added that the Pre-Raphaelites merited a visit – if you were stuck in the Black Country on a rainy Sunday. Flaming June was owned by the Ashmolean Museum in Oxford until 1967 when the Trustees sold it for a paltry few hundred pounds to a South American collector. 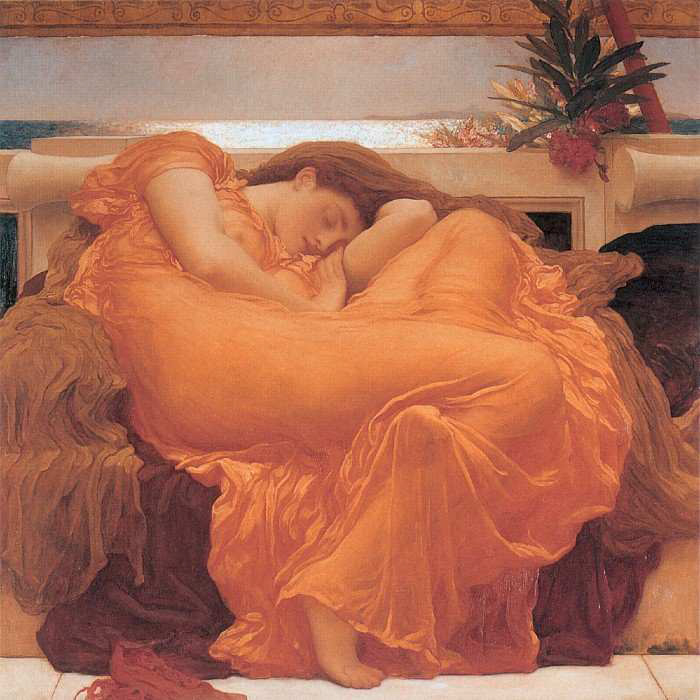 Now ” Flaming June” is seen in every poster shop the world over, on greeting cards, book covers, the painting must be worth millions. Tastes come and go, sometimes they go for ever, but it seems that the best of nineteenth century British painting is back to stay. he left it – as if the artist had just stepped out for walk. A place well worth a visit on a foggy London afternoon. Mamyia 67. The pose like that of the Casalisca proved to be impossible – no amount of twisting and contorting could pull Anna Chiara’s limbs into the position held by Leighton’s model. Painters have it easy – it was not a simple shoot. I recommend a stop-over in Puerto Rico for anyone who finds themselves stuck in Central America during a tropical thunder storm, for there in The Ponce Museum glows Flaming lune, four thousand miles away from her erstwhile home in Oxford.